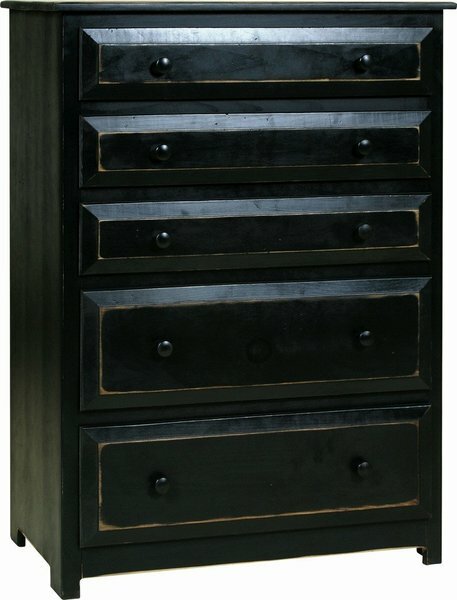 A very fine piece of bedroom storage, the Amish Pine Wood Chest of Drawers has five drawers for clothing and accessories. Two larger pine drawer boxes on the bottom and three more slender drawers on the top can keep clothes folded nice and neat. The pine wood itself adds its charm with a love for country, cottage and rustic style rooms. This pine wood dresser measures 45" high, 32" wide and 18" deep. It's handmade in Amish country in Pennsylvania. From the Heritage Pine Collection, this dresser ships free anywhere within the continental United States. Please email or call us today with any questions about our pine wood furniture. Thanks for shopping with us!